Check this great offers to San Francisco by Star Alliance! At the moment you can book very cheap flights in economy class with SWISS and Air Canada to San Francisco (USA) with departing from Barcelona (Spain). The flights are available from only €221 for a round-trip. The fares include hand baggage only. But this is a great offer. For less than 250 Euro to San Francisco and back! It simply doesn’t get much cheaper to cross the pond, so hurry and book! Possible travel dates can be found between January – May 2019 for that fares. To some, San Francisco, is the quintessential American city, and most first-time visitors discover a similar feeling upon leaving. The tumultuous rollercoaster of the city’s history, tied in closely with the history of the United States, has created a mecca of modernism and tradition, revolution and reaction, sassy style and sophistication. Find airfare to San Francisco now and don’t miss out on another minute of the action! San Francisco has experienced a parallel history with the nation’s evolutions and revolutions. San Francisco began as the Spanish colony of Yerba Buena, followed soon thereafter by the California Gold Rush, which exploded the city’s population nearly 25-fold within a year. An earthquake followed by the Great Fire nearly destroyed the entire city in 1906. Since San Francisco’s early cityhood it has been a mosaic melting pot of Chinese, Japanese and Italian immigrants (to name a few), many of whom were held at Angel Island, the West’s own Ellis Island equivalent. Today you can catch a ferry out to the historic island which is now a beautiful park suited for most outdoor recreation including cycling and jogging. San Francisco has been a bastion of social movements and progressive thinkers over the last century. Although it may not be the Summer of Love anymore, this city is still a product of its Hippie parents, civil rights protests and beatnik artist generation – as well as the dot-com boom and burst that came in the late 90s. The Critical Mass ride on the last Friday of each month is true to form for San Francisco. Hundreds of bicyclists gather and ride a route through the city streets to a predetermined destination to claim their rights to the streets (make sure you are not driving that day!). A walk through The Castro, the predominantly gay and artsy neighborhood, is also a must do. You will find exquisite boutique stores, antique book shops and some excellent independent movie theaters. The sights in San Francisco are just as diverse (and just as groovy) as its history. Discover the rugged terrain and map out the seascape of San Francisco from atop Telegraph Hill, where Coit Tower stands as a former beacon to sailing ships. 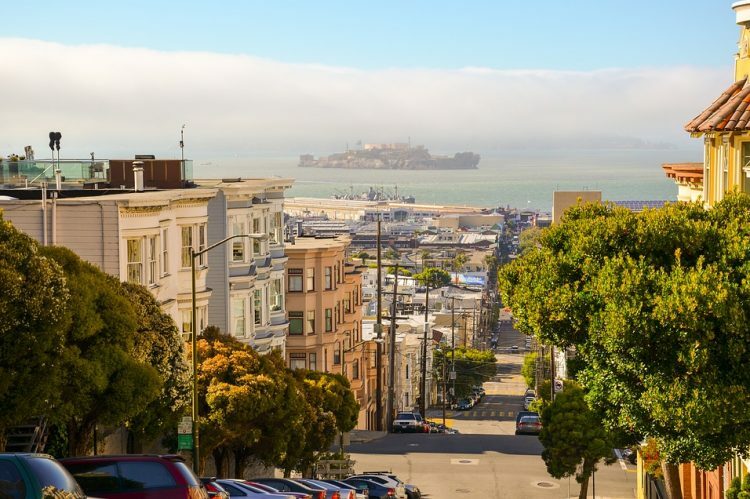 From here you can drop easily down into North Beach where Fisherman’s Wharf is buzzing with street performers, sea lion shows, and some delicious seafood. Golden Gate Park, larger than Central Park, is an escape in many different forms with its numerous gardens, exhibits and memorials – you can even encounter some roaming bison! Whether nightlife or daylife is what you are seeking in your perfect travel destination, you can be sure that San Francisco has everything to offer and then some. Discover the intense history and vibrantly ecclectic reality of this Northern California metropolis by booking your airfare to San Francisco today!